Melanie was born in London and still lives there. 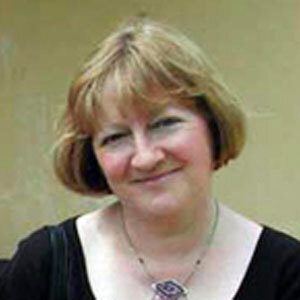 She has a Masters degree in English, studied for a DPhil on John Clare and Wilhelm Müller, and has always been a writer of one kind or another, from pieces on 'The Androgynous Nature of Love in Twelfth Night and the Sonnets' to being Senior Inspector for The Good Food Guide. She continues to write about food but for the past ten years has concentrated on music; she reviews for several publications including the US Fanfare Magazine and the UK based Musicweb. Lieder, Handel and Monteverdi operas and the works of JS Bach and Benjamin Britten are her special interests; her hobby of collecting 17th and 18th century needlework samplers probably reflects her view that if it hasn't got words, then she's not very interested in it – but she excepts Bach's 'cello suites and Beethoven's Late Quartets from that rule. Melanie teaches English Literature from home and is also an Examiner in the subject; she has three children, one Labrador and of course a long-suffering husband whose career complements hers in that he works in TV, specializing in music documentaries and drama series. Melanie has not yet become jaded about going to operas and concerts and then reviewing them, even when they inspire her to such comments as "Ditch the Dwarf, would be my advice", "I'd like to hear all this aria's notes in place just once before I'm eligible for my bus pass", "Someone needs to tell him that it's now close season on tenor-torturing", "So – where are we here – one of the world's great lyric theatres, or Madame Flutterbye's school for would-be directors?" and "...looks like a Greek god but does not sing like one".